1. Nullification. Fights between Congress and the president over presidential appointments have gone on for decades. But Senate Republicans have taken the fight to a new level by using the power to deny appointments to require changes in the laws. The Dodd–Frank financial reform established the C.F.R.B., but Wall Street hates it, and Republicans openly vowed not to confirm any director unless Obama agreed to weaken the law. This is an entirely new use of congressional power to block appointments. The normally mild-mannered James Fallows has called this “nullification,” and Republicans have begun using it to paralyze large swaths of the government. The normal presidential recourse against hardened opposition to an executive branch nominee is to make the appointment when Congress is out of session, but Republicans closed off that avenue as well, by holding pro forma sessions year-round. If it held up, this would give Congress enormous power over the president – allowing it to unilaterally halt any agency it likes in return for any demand at all. They have likewise refused to confirm any directors at all to the National Labor Relations Board, denying the agency a quorum and essentially halting the enforcement of federal labor law. So Obama tried the audacious and legally indeterminate move of simply declaring the pro-forma session a sham, insisting Congress really was on recess, and appointing his man. If it stands up to the likely legal challenge – the U.S. Chamber of Commerce is threatening to sue – Obama will have taken a dangerous new weapon out of Congress’s hands. Obama’s maneuver may stand, or it may lead to a further reform of the confirmation process. But allowing Congress to functionally eliminate full-passed laws simply by denying the president any appointments to carry them out is a dangerous precedent that Obama would be derelict if he allowed to stand. 2. “We can’t wait.” Obama began his second two years by trying to bargain with the new Republican-controlled Congress, figuring that if he could find middle ground with the opposition party, Americans would see progress in Washington. The strategy was a total political and policy failure, as Republicans repeatedly turned down compromise offers on every front, and Obama found his approval ratings sinking. Cordray offers an illustrative case in point. Republicans rejected his first choice to run the agency, Elizabeth Warren. 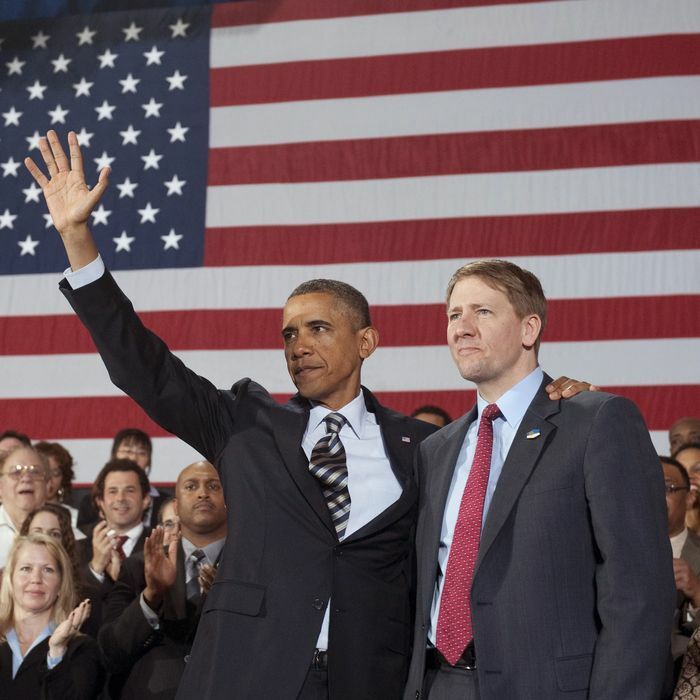 Obama then proffered Cordray, who has enjoyed bipartisan support. But Republicans simply turned around and said they like Cordray but planned to hold him hostage anyway. By early autumn, it had dawned on Obama and his advisers that their deep enmeshment with a dysfunctional drama on Capitol Hill merely made them look ineffectual. So, recognizing that Congress is simply treating every negotiation as a zero-sum contest undertaken with the goal of defeating him, Obama has abandoned any hope of negotiation or legislative progress. Instead he is dramatizing his opposition to Congress, making it clear that Republicans are standing in the way of his economic program. Part of the agenda entails talking up bills he knows Congress won’t pass, like new infrastructure spending. Part involves taking unilateral steps that bypass Congress, like executive orders or recess appointments. Obama’s political advisers believe that this makes him look strong and demonstrates his desire for action. I was skeptical it would work, but Obama’s approval ratings have indeed climbed. 3. Welcoming Wall Street’s hatred. A large part of Obama’s disastrous post-midterm swoon entailed trying to patch things up with business. Wall Street, furious with Dodd–Frank, Obama’s occasional flights of rhetorical criticism, and his plans to raise taxes on the rich, has spun itself into fits of hysteria against the administration, tilting sharply toward the GOP, which began working to repeal Dodd–Frank. Meanwhile, the public thought Obama was in bed with Wall Street and blamed him for the unpopular bailout begun by the Bush administration in 2008. 4. Trapping Mitt Romney. Obama’s primary charge against Mitt Romney is likely to be that he wants to return to the Bush era. The accusation will have several points to bolster it – lock in Bush-era tax levels for the rich, let insurance companies discriminate against families with a pre-existing condition – but the most powerful is Romney’s strong support for repealing Dodd–Frank. The accusation has resonance because Romney comes from the world of finance, has drawn extremely strong support from finance, and he simply looks like a stereotypical Wall Street shark.